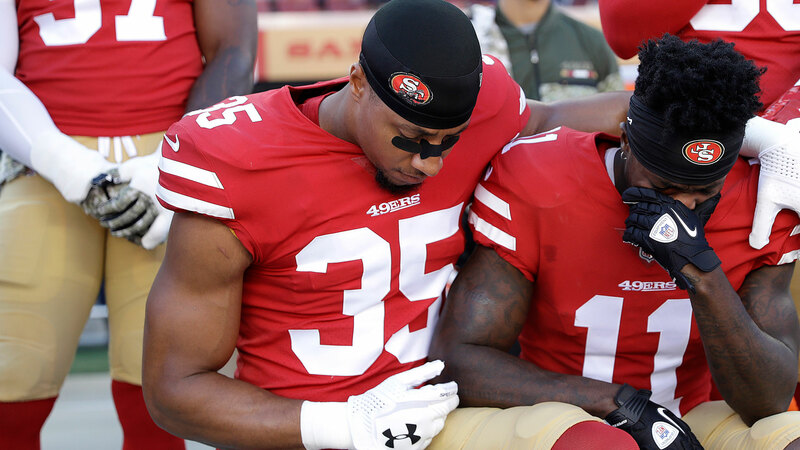 49ers Safety Eric Reid with Wide Receiver Marquise Goodwin before their game against the Giants. (NBCSports.com). Even ideals such as personal efficacy and faith produce division and misunderstanding among Americans today. But sometimes these societal conflicts are mitigated in unsuspecting arenas, one such place being the football field. Two events that day, however, turned the meaningless game into a lesson on selflessness and devotion. Early Sunday morning on November 12th, 49ers Wide Receiver Marquise Goodwin’s wife went into premature labor. The pregnancy was only 19 weeks along, and after complications the previous week, the baby was delivered stillborn. The baby, named Marquise Jr., died at 3:52 a.m. The couple remained with their child for as long as possible, until finally saying goodbye. In a matter of hours, Goodwin needed to suit up for the game against the Giants. Initially, he planned to stay with his wife, but she had other ideas. On his darkest day, faith gave Goodwin strength to set aside his own anguish, and instead tend to those who meant the most to him: his wife, departed son and his teammates. 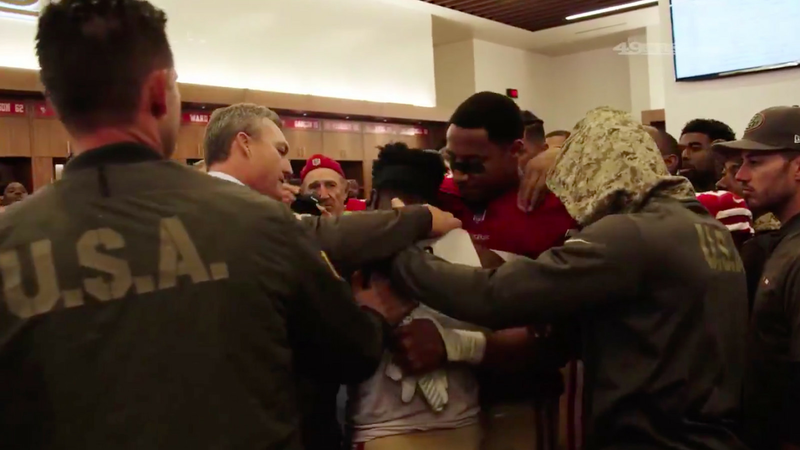 Around the time that Goodwin was summoning the strength to play, 49ers Offensive Tackle Joe Staley was waking up in pain. Two weeks earlier, on October 29th, Staley suffered an orbital bone fracture during a game against the Philadelphia Eagles. In laymen’s terms, Staley had a broken face. Upon impact, Staley’s eye socket had cracked, causing him to fall to the ground in pain. An injury of that kind can take weeks to heal, and cause symptoms like intense cheek pain when opening the mouth, facial numbness, swelling of the forehead and decreased or blurred vision. 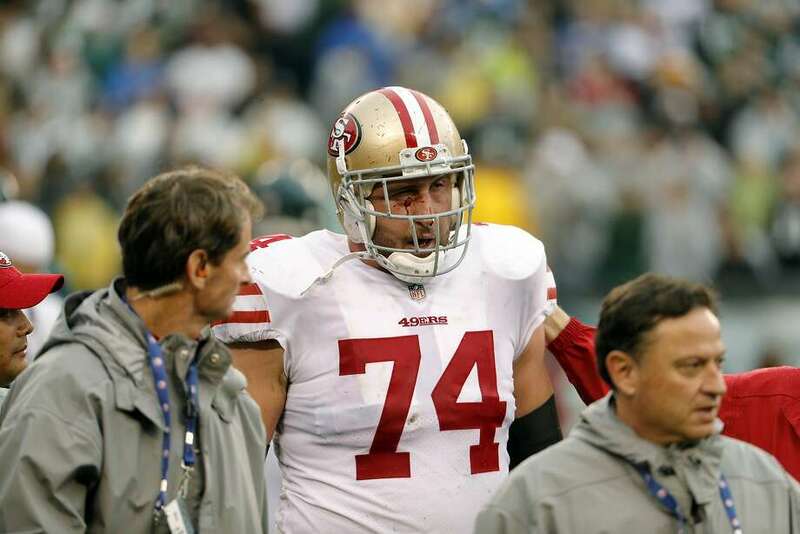 49ers Offensive Tackle Joe Staley suffered a serious facial injury against the Philadelphia Eagles, but played two weeks later against the Giants. (Chris Szagola/AP). On a day when he likely woke up in significant pain, and had every right to call in sick for the day, Staley showed up for work. He did so, undoubtedly, to fulfill a commitment to himself as a player. So, in an inconsequential game, one man took the field amidst unspeakable grief, and the other with a broken face. But despite their personal struggles, both men placed their obligations to others above their own interest and pain. Their proclivity for personal sacrifice, however, manifested from distinct sources: pious devotion and secular humanity. But their actions achieved the same goal of selflessly supporting their teammates, in effort to ensure the greater good over personal preservation. In short, they simultaneously practiced faith and humanism in the unlikeliest of arenas- the violent setting of an NFL game- and used their sense of conviction to lead their team to victory. And so we are left with an invaluable lesson learned outside of the classroom- humans of all convictions are able to selflessly work for the common good, even in a divided land like the United States. Liked the new conclusion very much.